With only 10 days to go till the release of Age of Empires: Definitive Edition, it’s time to ask ourselves the question, what exactly is this Definitive Edition? And what should you expect of it once it finally becomes available on the Microsoft Store on February 20th? Before we can answer what the Definitive Edition is going to be, let’s take a look at what the original Age of Empires had to offer. It launched back in 1997 and sparked one of the most successful RTS series of all time. With millions of copies sold, it was the first introduction to Real Time Strategy games to many of us, who received a demo to the game with their morning cereal. RTS games were a big deal in the 90’s and even though the genre matured over the past few decades, most of the original concepts can be traced back to the OGs in the 90’s. Age of Empires was such a pioneer as well and it served as the basis on which Ensemble Studios built the rest of the original series. When we first dusted off our original AoE disks to see what we wanted to achieve with the Definitive Edition, we were surprised how many little features we take for granted nowadays, were absent in the original game. Customizable hotkeys, attack move, idle military indicators, gather points for buildings, waypoints for units, multi-building queues or just the ability to start a game with random teams. This is where we had to ask ourselves a big question: “Which changes do we want to implement to make the game ready again for players 20 years later? All while still keeping the original game intact?” It was an interesting exercise and often it took many iterations to find the right balance between new and old. 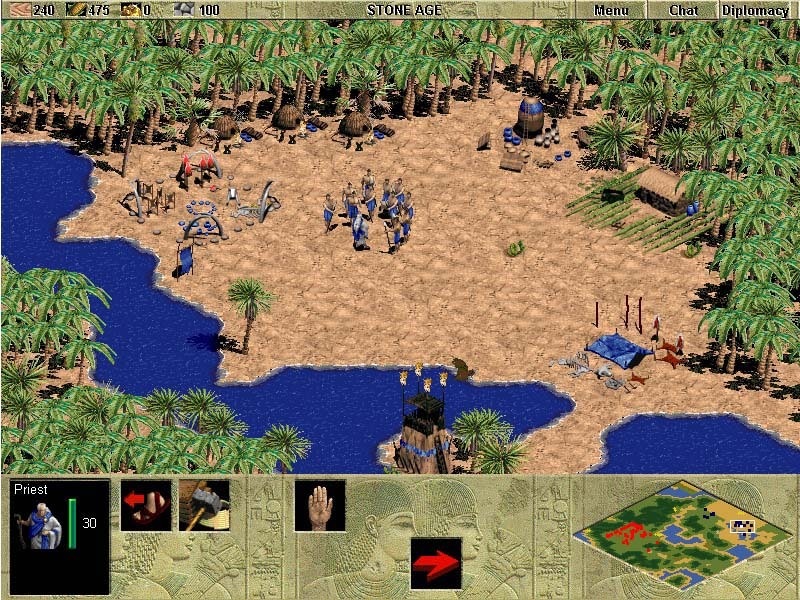 The best way to describe the original AoE is “a diamond in the rough”. But it is this crazy awesomeness that a lot of players associate with the original title. You could sneak a heavily armored Cataphract in your enemy’s town and eradicate his whole economy if he didn’t catch your Greek overlord in the act. You could flatten entire cities with rows of Heavy Catapults, but you could also accidentally run all your Hoplites under the tumbling stones and lose a fortune of killer machines. The original game could best be described as “unforgivably challenging“. Forgetting to wall of a tiny piece on your fortification or just having your army at the wrong place at the wrong time could lose you the game. Where the subsequent Age-titles were much more forgiving with garrison mechanisms, a wide array of defensive buildings or even instant mercenary troops, the original Age of Empires did not offer you such chances to rebound from a bad decision. Just like a Chess player can’t garrison his Queen when she’s about to be taken. So how do you polish this diamond? Besides the complete art and sound overhaul, we added a lot of quality of life features that are indispensable in nowadays RTS games. In other words, a bunch of extra tools and levers to fight your way through the ages! 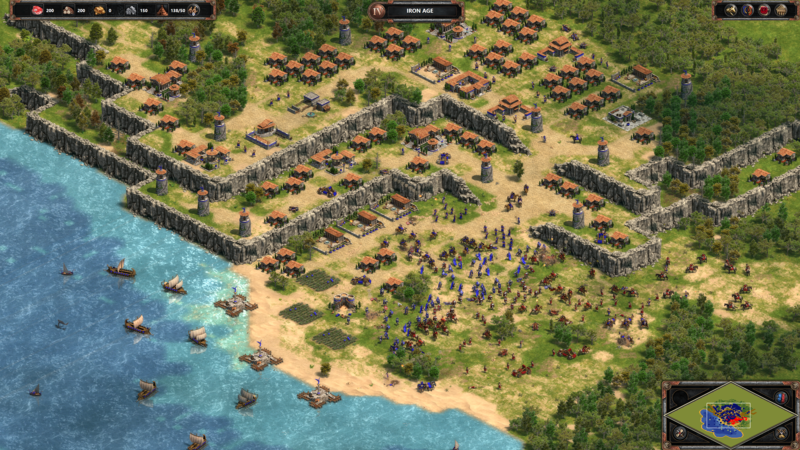 What is Age of Empires: Definitive Edition? Now we know what the original Age of Empires was and what we did with it, we can properly answer this question. Age of Empires: Definitive Edition is the original, rugged and purely tactical Age of Empires experience that marked the beginning of an amazing series. But with a lot of big and small additions to help bridge the gap of 20 years of advancement in RTS games. All coated in a gorgeous fresh lick of paint. We hope you will enjoy this good old fashioned title again and hope you can experience the delight of converting some enemy units to turn the tide in one of the crazy battles that Age of Empires: Definitive Edition has in store for you!